Wax Worm Breeding Kit.? Grow Your Own Reptile Food and Fishing Bait! Our Wax Worm Breeding Kits are easy to use and will save you hundreds of dollars in waxworms because you will be able to grow your own plump juicy wax worms. Worried about what you are feeding you pet?? Well, when you grow your own waxworms you will always know what they are eating because you made them yourself. You Will Be Breeding Your Own Waxworms in No Time Flat! Place about an inch of the bedding that comes with your kit in the bottom of the breeding kit. Place the waxworms that come with kit on top of the bedding. Suspend the egg layer fans over the medium using the included instructions. Place your waxworm breeding kit in a warm place.? On top of your refrigerator works well, or next to a furnace or water heater is also a place where you can heat your kit for free.? In the summer you can make waxworms without heat, but in the winter you want to find the warmest place possible that will be as close to 78 degrees as possible. Observe as your worms pupate and then emerge as wax moths.? They will lay their eggs in your egg layer fans.? The moths do not eat or drink.? They will die after a few days but you will notice yellowish tan masses in the egg layer fans.? Leave those right where they are and keep checking back on your kit periodically.? In about 10 days there will be masses of tiny worms in the bedding that you placed in the bottom of your wax worm breeding kit.? Keep feeding your waxworms as they eat the bedding/food.? The worms will grow very quickly as you feed them and you will soon have big, fat and lively wax worms for bait, breeding or feeding.? Repeat your breeding success using your own wax worms and our breeding kit refill packs, or follow our directions that come with your kit to make your own foolproof wax worm bedding.? Breed your own Wax Worms.? With each culture, you should be able to grow hundreds of wax worms for a fraction of what it costs to buy live Wax Worms retail.? 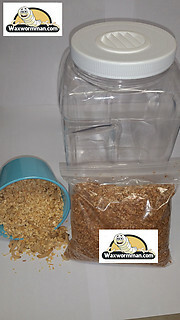 This is an educational kit as well as a functional breeding kit for making your own wax worms.? 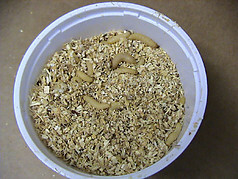 Our kit comes with 1 quart of Wax Worm Bedding, a vented breeding container, 100 larvae, and instructions.